Is your company innovating fast enough? The rapid pace of innovation today is making it harder and harder to stay relevant to consumers. Even the largest companies can't take past success for granted. In fact, the life expectancy of companies in the S&P 500 has shrunk dramatically over the last half-century. In the 1950s, for example, the average S&P 500 company lived for 60 years. Today, that lifespan is under 20 years. To stay relevant, leading companies are looking for approaches to get new and better ideas to market faster. One area critical success is product testing. Getting products field tested and ready for launch can take months. And not getting it right could mean the difference between success and failure. Like all companies wishing to succeed in today’s dynamic business environment, Sub-Zero needed to move faster and operate more efficiently—making better decisions to ultimately deliver more value to their customers. Sub-Zero calculated that delaying the release of a new product a mere two weeks could set the company back over $1 million. Of course, launching a product not ready for release could be just as devastating. To get high quality products to market faster, Sub-Zero is adopting an agile approach to consumer insights during product development. Let’s take a look at why and how Sub-Zero uses agile insights to deliver better kitchen appliances to their customers. An agile approach accelerates development cycles. In fact, according to one study, agile teams are able to release products 83% faster than teams that take a traditional approach to product development. What’s more, just because products can be released faster doesn’t mean these businesses are compromising on quality—quite the contrary. By leveraging more frequent, in-context insights from target customers, businesses can leverage data to improve products in ways that lab testing alone can't achieve. Sub-Zero product testing starts in a consumer use lab which serves as a center for testing, reliability and feedback. A series of in-house tests are run by the lab before sending products out into the field to be tested by consumers. The goal is to identify and address all issues before consumer in-home testing. Subsequent field trials typically run for 90-days with a survey at the end of the process. Any major issues identified here would mean delaying product launch timelines. This approach brought several challenges with it. For starters, the company couldn’t innovate quickly enough. The complete process for development and launch was taking longer than benchmark companies. Issues were being found after field testing that could have been caught earlier. And quality suffered because issues were identified but weren't prioritized appropriately. It was difficult for teams to understand the benefit of testing, because testing itself didn't result in meaningful improvements. For example, when testing a multi-cooker, issues came up repeatedly regarding the lid being too hot and food getting stuck in crevices which made the product hard to clean. These issues were captured in development but were never acted upon because the company lacked a formal process for prioritizing and addressing non-critical issues. After the product launched, they received complaints that demonstrated the importance of addressing consumer feedback. Knowing there had to be a better way forward, Sub-Zero saw the need for a more agile field trial process with real-time in-home testing and feedback. They also needed to build a more customer-obsessed culture that could prioritize consumer feedback earlier, when it was faster and less costly to make product improvements. 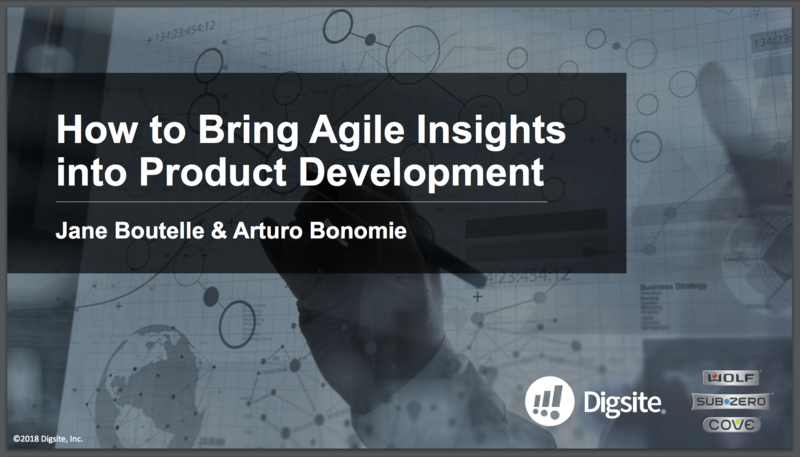 To realize the promise of agile, Sub-Zero shifted to Digsite’s Consumer Insights Communities during field trials. Rather than getting results after the trial was complete, this approach allowed them to continuously engage field test participants, thereby serving as a “one-way mirror into the user experience,” according to Arturo Bonomie, a senior product engineer at Sub-Zero. Sub-Zero also designed these communities to replicate all activities that were previously conducted in their lab, exploring all aspects of the user experience. And the encouraged consumers to share experiences and ask questions that might not have been anticipated in a lab setting. Sub-Zero conducts field testing by installing units directly in their target customers’ homes. At the same time, they have consumers sign up for their Consumer Insight Community—so they can collect user feedback and make it available to engineers in real time. By leveraging these feedback capabilities, Sub-Zero is able to get in-the-moment reactions from their customers through video sharing, providing the contextual understanding (i.e., the Y data) needed to learn why a certain feature falls short. Compare that to knowing that a certain feature falls short—but not knowing why or understanding exactly how to fix it. By seeing real-time feedback from consumers, Sub-Zero engineers are more quickly alerted to problems or concerns as they arise. Moderators can ask follow-up questions to diagnose concerns and other participants can chime in to validate problems quickly. Participants are sent meal kits or be provided specific instructions to use specific appliance features. This allows Sub-Zero to better gauge performance of specific features in consumers home environment, and create more of a test and learn environment within the field trial. These communities provide Sub-Zero with engaged participants who understand the importance of their feedback. Consumers more openly share issues or concerns vs. relying on calls to 800 # or open ended survey responses. They are also more willing to take photos and video's to clarify responses, improving the overall quality of their feedback. Since moving to Customer Insights Communities, Sub-Zero hasn’t looked back. Today, Digsite is used for 100% of the company’s field trials; Customer Insights Communities usage went from 7% to over 90%. As a result, the company has saved $2.5 million in warranty claims. The results speak for themselves. But how exactly was Sub-Zero able to transform its approach to product development? After all, many companies have established product testing processes and many employees are resistant to change. Sub-Zero shifted it's priority to Customer Insights Communities by getting senior management to buy in to the importance of making a change. They were able to show how Sub-Zero would be able to generate stronger ROI and prevent lost revenue. And they saw the potential first hand by having executives to participate in field trials in order to see exactly what the communities were all about. Next, Sub-Zero examined how to scale Customer Insights Communities to streamline the entire development process. This mean building weekly Sprints templates that made managing communities fast, easy to analyze and benchmark able. While at the same time tying results into decision action criteria so teams knew when to inject custom activities and iterate on solutions within the field trial. Faster and better problem identification helped the company would know exactly what to do with the results from each Sprint, ultimately helping them bring products to market faster. Finally, Sub-Zero added retrospectives to their communities, with feedback both from agile teams and field trial participants. The process itself could be continuously refined—in order to get even better results moving forward. Agile is a way of thinking that can be successfully applied to product testing. By learning in context, building solutions and optimizing as you move forward, you can release better products in less time. Getting started with agile is easier than you might think. It requires getting your team to buy in to the new way of working and get familiar with using sprints to get tasks done. It also involves using tools and technologies designed for agile teams. For the best results, look for technology partners that have aligned goals. Their solutions should be easy to use and allow your team to learn continuously. Start small with a pilot test. See how that turns out and improve your processes. Over time, your team will become comfortable with an agile approach. Your company will build better products and services—increasing your bottom line along the way.